...a cute trio, have a Happy Thanksgiving. All three look adorable.... Sounds like they had a great time trick-or-treating again this year..... That must be a very special neighborhood. They look so cute, Lisa! I'm glad the boys had fun and you could go with them. We didn't really have Halloween this year other than Debbie dressing up to go to school as a red headed witch and the kids didn't know what she was. I told her to tell them she was the Wendy's girl (would be fitting for Wendy Gap) and they would know who that was. We are getting a turkey from Buddy's Barbecue this year, we really like their high quality barbecue so hopefully the turkey will be equal to it. Wishing your family a blessed Thanksgiving! LOL! Yeah, that's exactly how I feel. One holiday to the next, wondering how it happened so quickly and trying to catch my breath between. Those are some awesome costumes. Were they home made? Sounds like so much fun. I love handing out candy. The boys look awesome! Happy Thanksgiving to you and your family. The picture is adorable!! I bet they had a blast in the haunted house! Did any of them get really scared? Does Pierce want to be a pilot? Wishing you all a wonderful thanksgiving! I like how their costumes aren't ones that are typical. My favorite is the Oompa Loompa. This year we ventured out of our neighborhood a bit. We hit a few houses, but went elsewhere because for the most part we don't have sidewalks. I'm sure, with the family you have, you will all enjoy Thanksgiving. It's a good family time. Looks like Halloween went well. You're good at the costume thing. My wife was , too, when we had little kids at home. Oh, they look awesome! Happy Thanksgiving! They are so cute, wishing a happy thanksgiving to you and your family! You boys look like they are having fun......and how quickly they are growing up! Happy belated Thanksgiving, my friend! 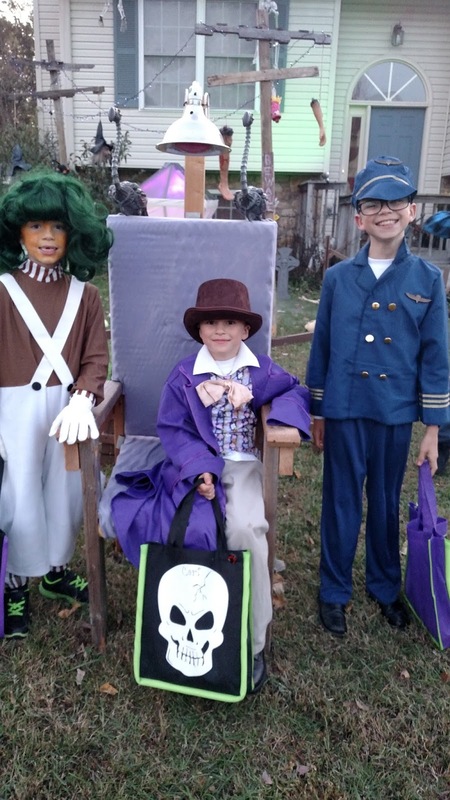 I love the kids' Halloween costumes--I'm so glad you had an awesome time trick-or-treating. I love their costumes! I think Liam is going to be an Oompa Loompa next year! Love the kids' costumes, especially the Oompa Loompa! Their costumes look fantastic! Glad you guys had fun.